Draw a triangle and add a point P somewhere on its boundary or in its interior. Next, connect P to each of the three vertices. The triangle will be split into 3 smaller triangles, possibly degenerate. Label the fraction of the area of each of the smaller triangles to the area of the original triangle by x, y, and z as shown in the figure. Because the sum of the parts is equal to the whole, x + y + z = 1. Notice that if you specify the value of x, then P must lie on a line parallel to segment BC, because specifying x fixes the area of the corresponding triangular piece. If we compute this area using the formula one-half base times height using side BC as the base, we see that the distance of P from side BC, which is the height, must be constant. 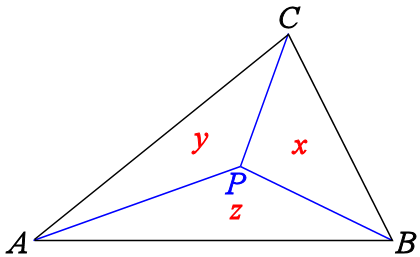 Similarly, once y is specified, P is confined to a line parallel to segment AC. Combining these observations with the fact that AC and BC are not parallel shows that P is uniquely determined by the fractions x and y. So, the triple (x, y, z) is uniquely determined by P. Therefore, we can think of (x, y, z) as a kind of coordinate system for points of the triangle. We call these coordinates the Barycentric coordinates of point P.
It’s true that specification of any two of the Barycentric coordinates determines the third, but it’s nice to keep all 3 coordinates around because of the symmetry. And, although we defined the coordinates in terms of ratios of areas, we could have defined them in terms of ratios of lengths. For instance, since triangle ABP and triangle ABC share side AB, the ratio of their areas equals the ratio of their heights (with respect to base AB). You could also draw the Cevian from C through P to point C‘ on AB and define z as the ratio of C‘P to C‘C. Yet another way of interpreting Barycentric coordinates is that if you place point masses with masses x, y, and z at points A, B, and C, respectively, then P is where the triangle will balance. 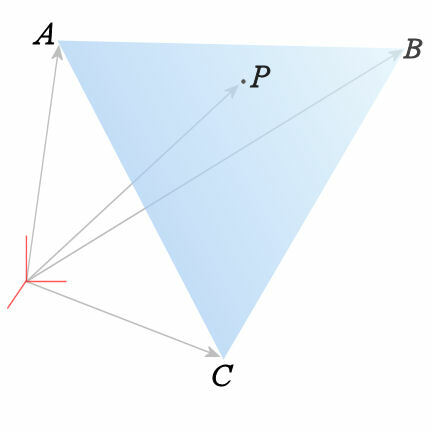 Barycentric coordinates conveniently tell whether P is a vertex, is in one of the triangle’s sides, or is in its interior. These 3 cases are distinguished by how many coordinates are equal to zero. If two are zero, P is a vertex. If exactly one is zero, P is in a side. And if none are zero, P is in the interior. If you think of A, B, C and P as vectors emanating from the origin of some coordinate system, then P = xA + yB + zC. This formula is valid even if the origin isn’t in the plane of the triangle! Here’s another way to think about Barycentric coordinates. The set of points (x, y, z) in the xyz Cartesian space which satisfy x + y + z = 1 and x, y, z 0 is an equilateral triangle whose vertices are located at (1, 0, 0), (0, 1, 0), and (0, 0, 1). So you can think of the map from the point P to its Barycentric coordinates (x, y, z) as a map from triangle ABC to this special equilateral triangle. In triangle ABC, A’, B’, and C‘ are on the sides BC, AC, and AB, respectively. Given that AA’, BB’, and CC’ are concurrent at the point O, and that , find . which can be simplified to . which expands to . Using the fact that Barycentric coordinates satisfy x + y + z = 1, the above expression reduces to , so the answer is 95 – 1 = 94. If you want to practice using Barycentric coordinates, use them to solve Problem #9 on the 1986 AIME and Problem #8 on the 1999 AIME. Armed with Barycentric coordinates, you might even be able to see through these two problems entirely in your head and then find the answers with a quick paper and pencil calculation. This entry was posted in Contest Math, math, Math Education and tagged AIME, coordinates. Bookmark the permalink.